It may seem like a strange notion to those who have never done it before, but buying a great pair of binoculars takes quite a bit of research and knowledge. Just like anything else, a quality pair of binoculars will provide you with a lot better images than buying a cheap pair from a discount store. As technology has improved, binoculars have become more modern and have improved in quality. Nevertheless, there are still some basic features that you should look for in a pair of binoculars, and this is what we will explain first. We hope that this guide is useful to you in finding the perfect pair of binoculars for your needs. Choosing just one pair of binoculars to crown as our number one pick is a difficult thing to do. But if we had to, we would choose the Upland Optics Perception HD 10x42mm. These binoculars are tough as nails and give an excellent picture quality. They have the perfect magnification and field of view for a general pair of binoculars and can be used for everything from hunting to bird watching. Our partner company Upland Optics does an amazing job, these binoculars are first class! Click here to see their price. One of the most important features in a pair of binoculars is the magnification and objective lens diameter, which is typically included in model information. For example, in the Upland Optics Perception HD 10×42 mm – “10×42” is the magnification x objective lens diameter. The magnification will usually appear as 8X, 10X, or even higher. When a pair of binoculars has a magnification of 10X, it means that you will be able to see a distant object 10 times larger than you would if you were not using binoculars. For instance, if you are viewing something that is 500 yards away, it will appear as if it were only 50 yards away. 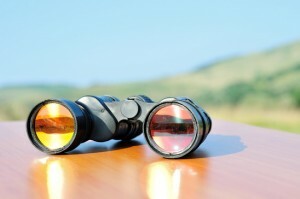 Magnification is often the most important thing that a buyer will look for in a pair of binoculars. In the example above, 10 is the magnification, while the 42 means that the objective lens diameter is 42 millimeters. Lens objective size is very important, as larger lenses collect more light than smaller lenses. This means that objects will appear brighter in binoculars that have larger lenses. Furthermore, the size of the objective lens will greatly affect the field of view you will have, which we will discuss next. So, if you are comparing binoculars and they have the same magnification, the lens size will determine the field of view. The units of measurement that you may see when looking at field of view statistics are degrees and feet. When you see degrees, you will often see two numbers, and these will represent the degrees in the actual field of view and the degrees in the apparent field of view. The actual field of view is the number that matters. The apparent field of view is calculated from the actual field of view. The actual field of view is the angle of your viewing window at the point after the binocular lenses. If you have a pair of 10X binoculars, and your actual field of view is 5 degrees, then your apparent field of view will be 50 degrees. You simply multiply the actual field of view measurement by the magnification of your binoculars in order to get the apparent field of view. When the field of view is measured in feet, it is a bit less complicated. If you see a field of view of 300 feet, it means that you are able to see 300 feet at 1,000 yards. This means that if there were a 300-foot building off in the distance, you can get as close as 1,000 yards and still be able to see it in its entirety through your binoculars. For people who wear eyeglasses, eye relief is an important specification. Eye relief is closely related to field of view, as it is the distance that you can hold the binoculars away from your is a good rule of thumb for people with eyeglasses. With sufficient eye relief, a person that wears glasses is able to enjoy the same field of view as everyone else. The exit pupil diameter relates to the brightness your binoculars provide. It is the measurement of the size of the ray of light that will hit your eyes after it travels through the lens. The exit pupil diameter is determined through dividing the lens size by the magnification. The larger the number that is obtained, the brighter the images will appear when viewing through the respective binoculars. Matching a higher magnification with a larger lens size ensures that you will not sacrifice on the brightness of your image. Aside from those key specifications that were discussed above, you may be interested in some other features that are common in binoculars. Many people find that having compact sized binoculars is an advantage when traveling through rough terrains or carrying lots of equipment. New technology is constantly improving on the size and weight of these binoculars. Currently, you can find models that weigh half a pound and are of very high quality. In the future, compact sized binoculars may even be the norm. Today, however, many are not as powerful as their full-sized counterparts. Many environments where binoculars are used are treacherous, and binoculars are constantly exposed to the elements. Water can damage the equipment that we carry, so developers have started to design water resistant and waterproof binoculars. Many also include fogproof design. While the degree of water protection may vary, this is a good feature that will prevent your binoculars from fogging up or getting water damage. Some binoculars may even be able to submerge in water for a short time, but make sure that you have checked your manual before attempting that. Lens coating is often what differentiates cheap binoculars from high quality binoculars. Binoculars that are worth buying often have at least one coat over the lenses that improves clarity and protects them from scratches. This makes them more durable, and they will produce higher quality images for a longer period of time. If you are looking for binoculars for general sport use, marine use, or for the theatre, you will want at least a pair of 7 x 25 lenses. This will ensure that you have enough magnification, but not too much where your field of view will be impaired. The field of view should be between 300-350 feet, with the higher end being for marine use. 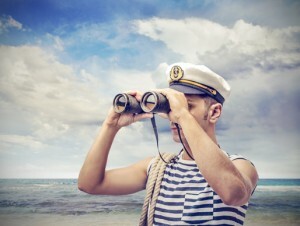 You may also want to consider waterproof binoculars for marine use. 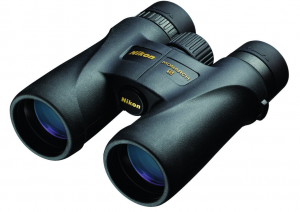 For bird watching and hunting, you will want a pair of 8 X 30 lenses. Waterproof is always a good idea for these purposes. The field of view should be at least 350 feet. You may want to consider more powerful binoculars if you are looking at far away animals, or maybe even a spotting scope to complement your field binoculars. If you want binoculars for golfing, either as a player or a spectator, a pair of 6 X 17 should suffice. In golf, you are looking at stationary objects that are not terribly far away, so you do not need very high powered lenses. A range finder may be useful if you are using them for golf in order to know the distance between you and the hole or other obstacles such as bunkers and bodies of water. Stargazing presents a special set of circumstances, as you are viewing stationary objects that are very far away. To make it more complicated, the environment will have minimal light available. 10X 40 binoculars are typically recommended for this purpose. You can afford higher magnifications because you will not be moving the binoculars much, and to make up for the diminished field of vision and darker images that this will present, you have the large lens diameter. When hunting big game, binoculars are one of the most important pieces of gear you will need. They will allow you to scan for animals that you cannot see with your naked eye. This makes them an indispensable tool in the field. There are a few key things to keep in mind when choosing a pair of binoculars for hunting. First off, remember that you’ll often be looking for animals in low light conditions, so light transmission is crucial. Also, you’ll be lugging them around difficult terrain, so buy a quality pair that will be able to take a few bumps without any major problems. 10×42 is the most common size of binoculars to carry while hunting, although you may want a larger pair if you are doing long range spotting. The upgraded version of our #1 recommendation above, the Venator are the pair to get if you are a hunter looking for the best glass possible. With excellent light transmission and lens coatings, they deliver top grade optical performance while also being durable enough to survive hunting in the toughest of environments. If birding is your hobby, the following are some binoculars that you should definitely consider purchasing in order to have the best viewing experience. Because birding is more about the picture quality and feel, picking a pair of binoculars without trying them first is very difficult. When engaging children in nature activities, the right set of binoculars can go a long way towards getting them excited about their surroundings. Certain binocular features are more important than others when it comes to children’s binoculars, such as the maximum magnification level. The recommended maximum is 8x, as this gives children a wide enough view to keep their eyes on the interesting sight even if their hands are shaky. Open ranges can be a thing of beauty all on their own. However, there are few ranges that cannot be enhanced by a great pair of rangefinder binoculars. Regardless of the type of rangefinder binoculars you plan on purchasing (golf, hunting, digital, etc. ), the goal is to improve aim while also allowing for a wide field of view regardless of the terrain. If you want this feature in a separate device, you can always get a stand alone laser rangefinder. If you are on a tight budget and can only spend $100 or less, you can still get quality binoculars. 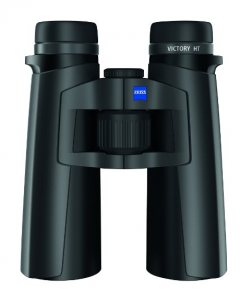 The following binoculars will offer great quality for their price. These binoculars are so good that you may find some vendors selling them for $200 due to demand, but if you look in the right place, mainly online, you can find them for under $100 dollars. They provide a quick central focus system and a 420 foot field of view. One downside to these is that they are not waterproof. Celestron simply makes great quality products at a great price. These are great for stargazing and many other uses, and they have a water-resistant, not waterproof body.